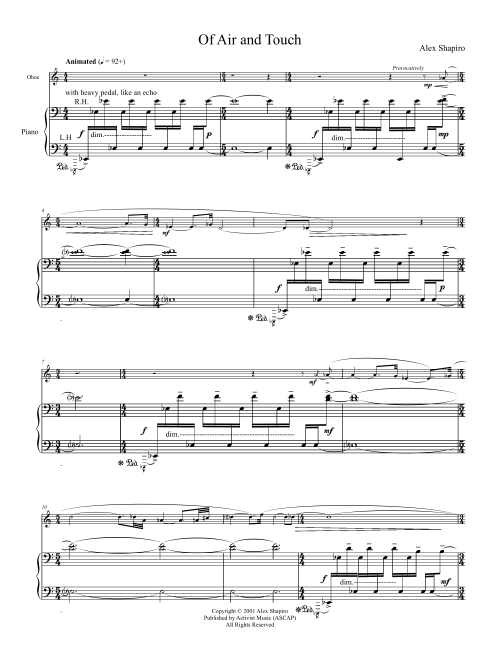 Of Air and Touch is a passionate and exciting piece for oboe and piano duo, and offers an adventurous oboist a broad range of music to explore within a single movement. This sonata is an adaptation of my 1999 bassoon and piano work, Of Breath and Touch. 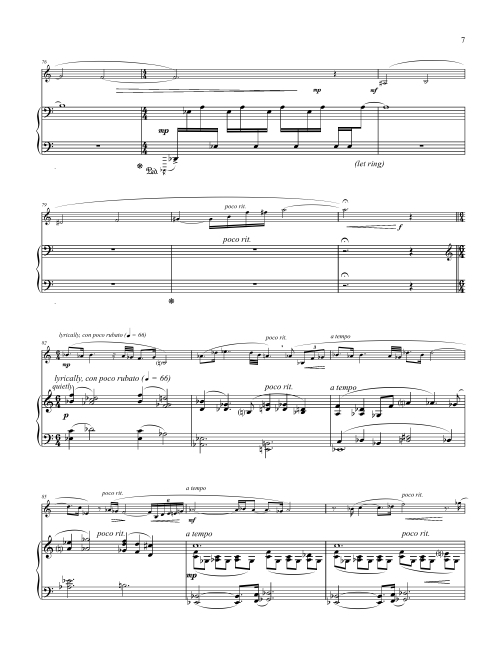 While I couldn't easily explore microtonality in a duet that strongly features the all-too-well tempered piano, I did reference the driving rhythms of some Middle Eastern music in a hypnotic and ostinatic piano part that's fun to play, and the double reed writing showcases the extraordinary range and tone of the instrument in the hands of a fine player. The result is a uniquely American piece that is informed by other cultures. The title refers to the nature of each instrument, as well as to a more sensual pair of pleasures. Beck and Call, on Crystal Records CD 846. Click CD for more info. "Carolyn Beck has been principal bassoonist with several orchestras and studio pickup bands, and is widely known as a champion of new music. From the selection listed above, she commissioned and/or premiered the works by Alex Shapiro, Moshe Zorman, and Don Chamberlain... [Beck's] attention to expressive detail pays dividends throughout: in the jazz-influenced lines of Previn’s 1999 Sonata (the notes mention Monk and Bird but I find Bill Evans a stronger influence, certainly in the piano-writing) and in Alex Shapiro’s short fantasy Of Breath and Touch. This last piece imaginatively couples a Middle-Eastern-style moto perpetuo from the keyboard with a melody of long-held notes from the bassoon. Following an introspective central section, it revisits the busy opening as a brief coda." "One new voice to emerge on this recording is West Coast composer Alex Shapiro, in "Of Breath and Touch" East. In the opening measures of the work you can hear the "town crier" high up in the minaret reporting on the events of the day. The work is somber in mood, at once angular and lyrical, with splashes of contrapuntal dialogue between the bassoon and piano. Although one would expect a work containing such vivid colors and multiple layers to be dense and overwhelming, Shapiro's writing is clear and idiomatic. Beck's playing is strong and sure throughout and the listener can hear a clear connection between composer and performer." Commissioned in 1999 by bassoonist Carolyn Beck. Premiered in March 2000 in Los Angeles, CA. by Carolyn Beck, bassoon and Delores Stevens, piano. Recorded in June 2001 in Los Angeles, CA. Audio clips of "Of Breath and Touch" performed by Carolyn Beck, bassoon and Delores Stevens, piano.